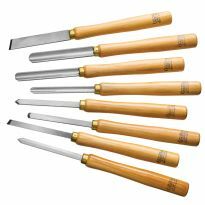 Compact, comfortable rubber handles provide excellent control and reduce fatigue—replaceable carbide tips need no sharpening. 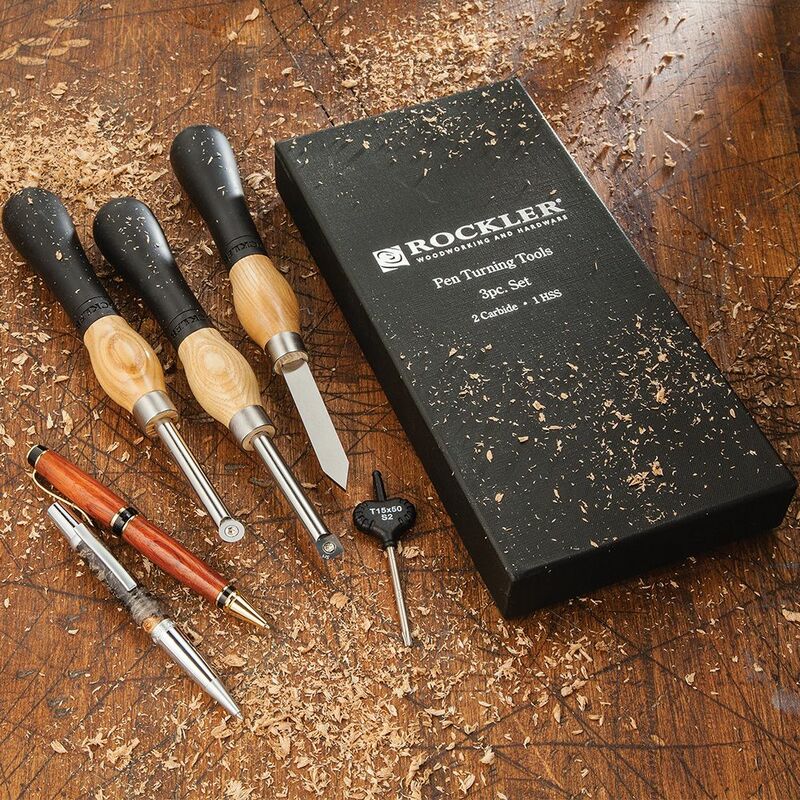 At only 9-1/2'' long, these tools are the perfect size for turning pens, bottle stoppers and other small items. 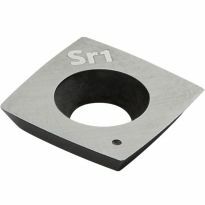 The carbide cutters can be easily rotated to expose a fresh edge. 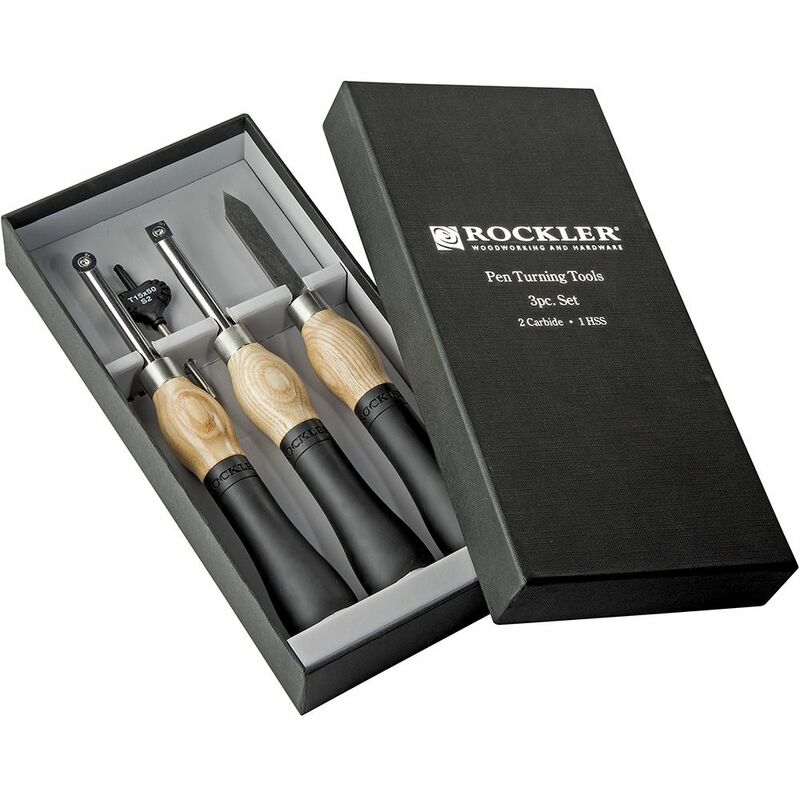 Set includes one high speed steel 1/8'' parting tool, and two tools with replaceable carbide cutters: a 1/2'' round cutter and a 1/2'' square cutter with a 2'' radius that produces an exceptionally smooth finish cut. Handles are solid ash encased in thick, molded rubber for excellent ergonomics and a sure grip. Wood Shop Teachers still exist! The first ones that I have ever used. Love the Carbide Turning tools, the first ones that I have ever used. Should have gotten a set long time ago. good. Round is best for acrylic. These tools work very well. I would have preferred a carbide cut-off tool, but the provide one wrks just fine. Very pleased with the lathe cutting tools. My first experience with the lathe tools and am quite pleased with the sharpness and quality of the product. Love my new turning tools. The carbide cuts like butter. So glad I bit the bullet and got these instead of HSS. The size is just right for pens and small projects. I love this set, they work very well with acrylics, Smooth cutting and well fitted in my hands. Good control. These are awesome, cuts through acrylic like butter! I am very happy with my carbide tipped, ergonomic pen kit. It makes my turning much easier. I’m only sorry I didn’t find out about it years ago. Tools are great. Effort less. Highly recommend. I am new to the lathe so am learning to use these tools which I have found to be high quality and easy to use. However, on two different occasions after an encounter with knotholes the cutting heads came off the tool. After search and rescue missions, I found the cutters and the screws. The solution: before, during, and after use check the tightness of the screw with the nice tool supplied with the set. The carbide tip tools are easy to use and work like a charm. So far I've made French Rolling Pins, the photo attached shows a roughed in rolling pin turned in about 20 minutes. The carbide tool is sharp and easy to handle. Bought the smaller ones first to see if I liked them, definitely will be shopping for the big boys next! I really like them. 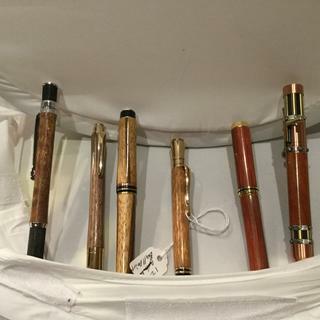 They are perfect for pens and small items. They feel great in your hand. I bought these for my son. He just loved them. He said You have to get use to there small size but once you do there awesome. I love it, works great. WOW! These are the BEST pen turning tools I’ve ever owned. 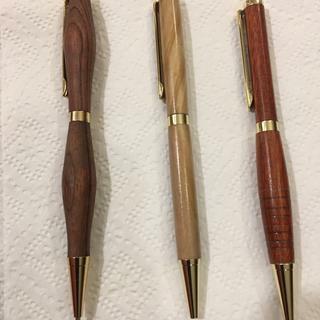 First time using the turning tools, I turned two pens in a short period of time. The work very well!!!!! 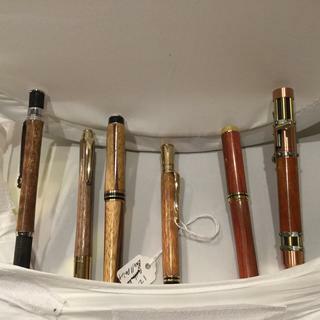 Great little set, perfect for turning pens and rings. Got a new lathe for my birthday Just starting and am having a ball. Learning day by day. For pen, or small project turning these work wonderfully. 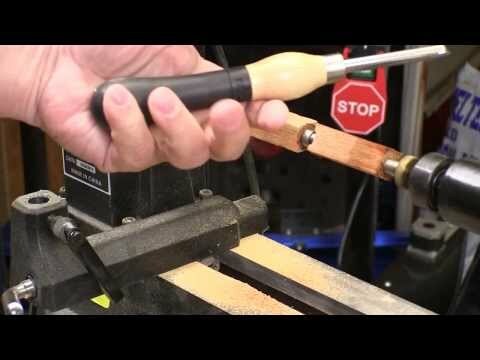 Great feel to the tool and makes turning har seasoned wood blanks and antlers. I would like to know how and where I can buy extra tio for the carbide. Haven’t been able to find them. Exactly perfect for me to learn to turn pens and other small things like Xmas ornaments, bottle stoppers, etc. I recommend them to any beginning turner. There is absolutely NO learning curve. 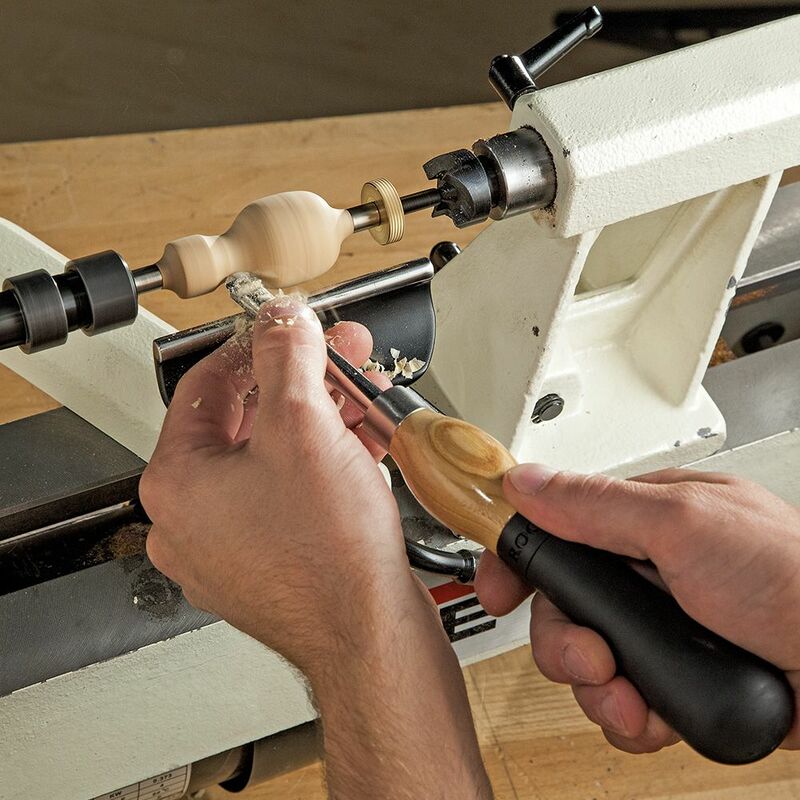 Watch videos online and you'll be able to start turning immediately! 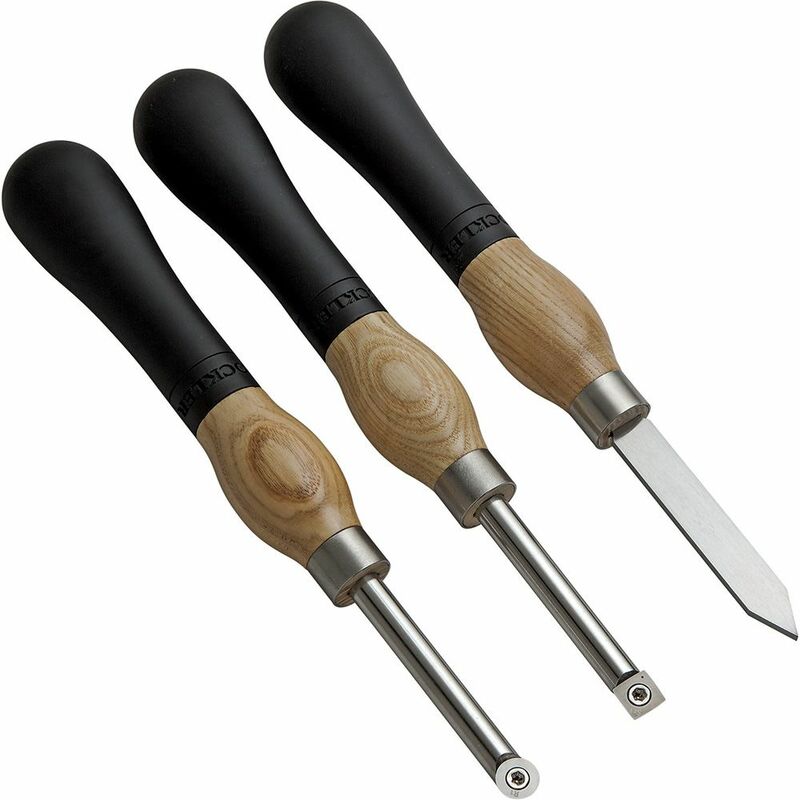 The quality of these turning tool is very good: solid handles, comfortable grip and true. My daughter finds them easy to manipulate when creating her objects. works vary well, stays sharp no mater how hard the material. I have been doing high end custom cabinetry and carpentry for nearly 20 years. 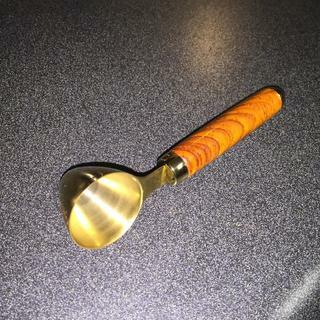 I am however new to turning. Picked up a lathe and this set on the Black Friday deal. I was a bit nervous never having used one or being taught. I watched a few videos online and decided to try it out. These tools made it SO EASY to walk up to the machine and start turning! I have a new toy to play with and can't wait to see what I can make and how I can incorporate it into my work. 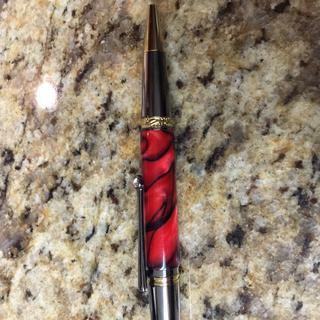 100th pen completed; some acrylic, some wood; many, many deer antler, and several with Celtic knots and segments made of somewhat think metal (as much as 0.025") and other materials. Being able to turn the cutting surface is a great help, ALWAYS a sharp edge. I still have some more to go before I have to either sharpen or replace the cutting head... maybe the next 100 pens! I may buy the longer handle set because the only issue (very minor) is that the shaft heats up at times and get hard to hold. I think the longer handle will solve this problem for me; however, my youngest son has become quite the pen turner and has made several pens using these tools. The small handles are just perfect for the teaching of turning to young children, they do not feel so intimidated by a large tool. My 10 year old wood turner! First carbide tool set I've used. They are great, especially when used on acrylic blanks. Very little sanding required. 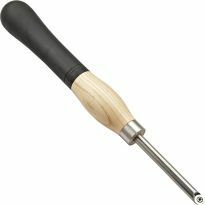 Just the thing for small turnings , I only wish a carbide detail tool had been included. I started with a number of skews and other truning tools. They got dull so fast it seemed I spent more time sharpening than turning. I've been using this set for over a year and I'll never go back. Wife uses the set for pin turning. I have been very pleased with this tool set. 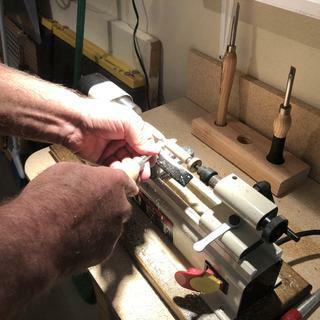 It cuts cleanly and is very nicely made so they feel solid in your hand- I have found I can get an extremely smooth finish without any turn lines with the round and square tools. Very good value for cost. Works as advertised. Does wonderful job. Inexpensive, replaceable cutters. Great set of tools. Bought for my husband as gift, great price and performs well. Definitely recommended. I have only used them once so far, but was impressed with them. A little shorter than I am used to, but that is just a matter of getting used to them. Worked very well. I use these 99% of the time. These hold their sharp edge forever. I would absolutely buy these again if I ever had to. This is a nice set of carbide tipped turning tools. I was really impressed with these. I was a little worried at first because they are much shorter than any turning tool I have used before. Surprisingly after just a few minutes all worries were gone. Taking it slow and not trying to take a large bite into the material is all it takes to get accustomed to these. I wish this set had came with the Detailing tip instead of the parting tool. But it was on sale at the time and I plan on purchasing the Detailing tool later. Which will still be less of a cost than getting the set with the Detailing tool right now. I strongly suggest to anyone wanting to use any size of carbide tipped turning tools that they ensure the top edge of the tip is in a horizontal line with the handle and the center of the workpiece. I wouldn't suggest using these to do rough cutting into say a square block before it is rounded properly. To large of a bite could send your tool flying in any direction. Sometimes even a small increase or decrease in rotational speed is enough to change your results for good or bad when using these shorter tools. Excellent Tools - Makes Old Tools Obsolete! 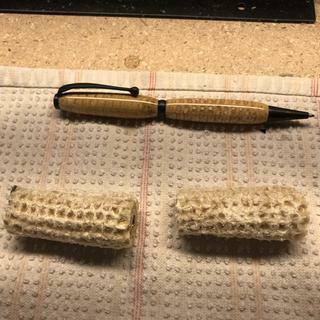 I have found the tools are just right for turning ink pens, key rings, and other small turning projects on the mini lath. They fit comfortably in my hands. I'm very pleased with them thus far. I choose the turning tools because of Price and feedback from others. Wanted a better set friend recommended this to me. 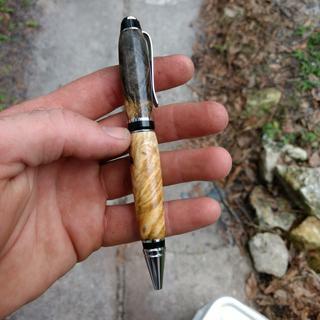 Starting to make pens with sons. New to pen turning and wanted a starter set of carbide tipped tools. Looks like a good starter set and I choose carbide whenever possible! Seems like a good way to get into carbide bits without breaking the bank. I bought this set because the price is right. I just bought a midi lathe and I wanted a set of carbide turning tools. I don't need to be learning sharpening skills at the same time as turning skills. I know I'll be buying more tools later but I want to outgrow a smaller set first. These had consistently good reviews and a very reasonable price. 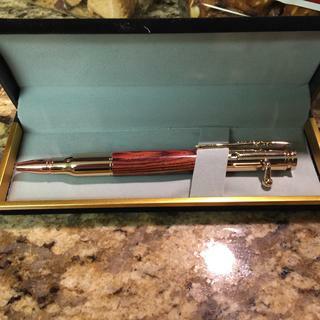 Wanted to get a good set to begin my pen turning career. Rockler is a solid name and I trust them to get me started on a new hobby. 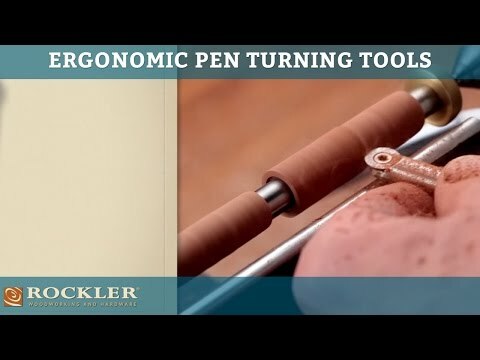 Interested in turning pens and I have found regular turning tools are difficult to control when working with small items. looks like a good set. These tools were recommended to me by an experienced wood turner. 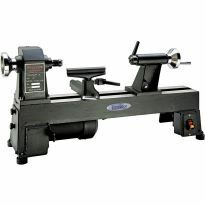 I have some Rockler products and like and trust them. I also like that the carbide tips can be replaced. Additionally, they were on sale and I like a bargain as much as the next person. Wanted small carbide set for turning pens and price was good after going on sale. 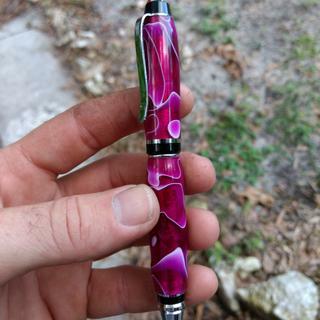 I turn a lot of pens and sharpening chisels takes time away from the lathe. Needed a set of these because I don't have these yet. This will be my first set. Just getting into turning small objects on a micro lathe and the tools I have are way to big for the purpose. 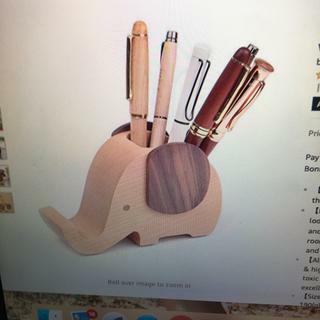 This set looks like the perfect solution to my problem. 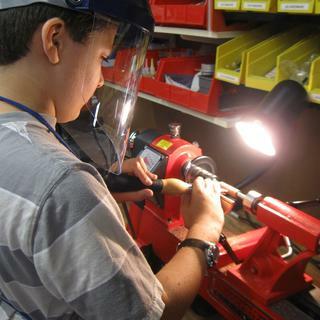 My son is new to workworking and I was told this is a great product and Rockler is a very good company. 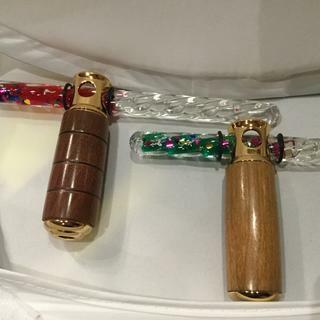 These are excellent cutters and get through wood and acrylic easily. 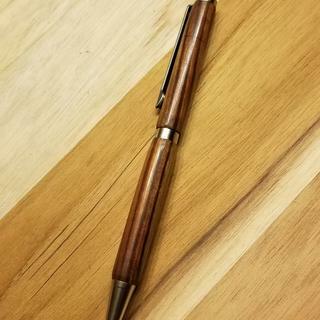 I'm just learning how to make pens and I've watched quite a few videos on what turning tools are the best for beginners. This set came up in more than one video I watched so I'm looking forward to using them. 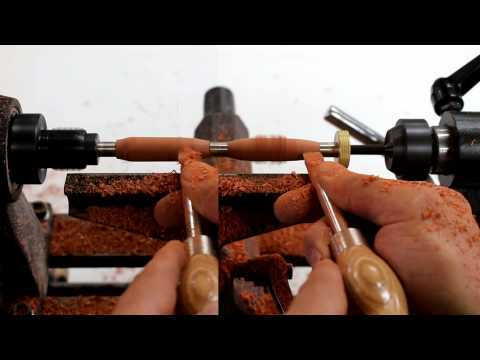 I turn Christmas ornaments and at times the handles are to long, to control correctly. And I thought at the price I could try them out to see how they would work . Great buy and look forward to using the set! I just got these tools and they don't seem very sharp. Does anyone else have this problem and what can I do about it? If you have diamond stones you could use a high grit to touch them up as well. I have read on other forums about touching up or even enhancing the edge using high grit diamond plates. I plan on trying it on mine once they are worn a bit. I don't think you can sharpen these with sand paper. Maybe knock off a burr if you have one but there is no way you can make them any sharper with sand paper. Either you are not running at high enough speed, or you are not holding the tool at the right angle to the wood. Have fun turning. I had my lathe running as fast as it would go. They don't feel sharp to the touch. Have a knife sharpener sharpen them or if you have good stones or a wheel, sharpen them your self. Mine where very sharp. I had no problem with my set, but you could touch it up a bit with fine grit sand paper. Try lowering your tool rest and change angle. 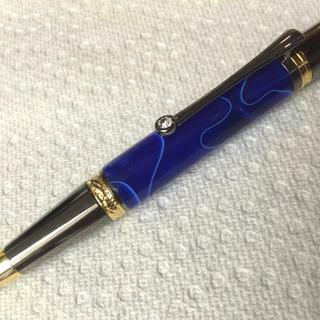 I know most pen blanks are 3/4" x 3/4". Could these cut larger blanks ? BEST ANSWER: The short answer is yes, You can use them on any size blank the same as a traditional turning tool just watch the over hang. Yes they can I have turned new couch feet with them they were about 4 inches in diameter . I have been using the tools for 1 year and have just had to turn to new sides of cutters- I do nto turn every week-end but turn several times a month. I am still using the same cutters, although considering replacing cutters now. It depends on the hardness of the wood you are turning. I still use, although looking to replace cutters now. What am I doing wrong if I am not getting a smooth cut with these tools? BEST ANSWER: Start with your "Round Tool" on both wood and acrylic,, highest speed on the acrylic, mid speed on wood (maybe 1800-2200 RPM). Tool rest directly perpendicular to the blanks corner. VERY light into the blank, and light on the touch for the first several passes. depending on the blank composition it may chip out at the ends... Slow Down! Easy into the material! Once you get the blank down to round use your "Square Tool" and make long even passes on the material, this will get out all the "roll marks" from the round tool. By the time you get to the bushings you will have a VERY smooth piece that may only require micro mesh sanding to finish.... Good Luck! It might be one of three things: 1. Some materials just do not machine well. Coarse grained woods tend to chip more than fine grained ones, and woods, like some pines, have resin filled grain structures that cause uneven cutting. 2. 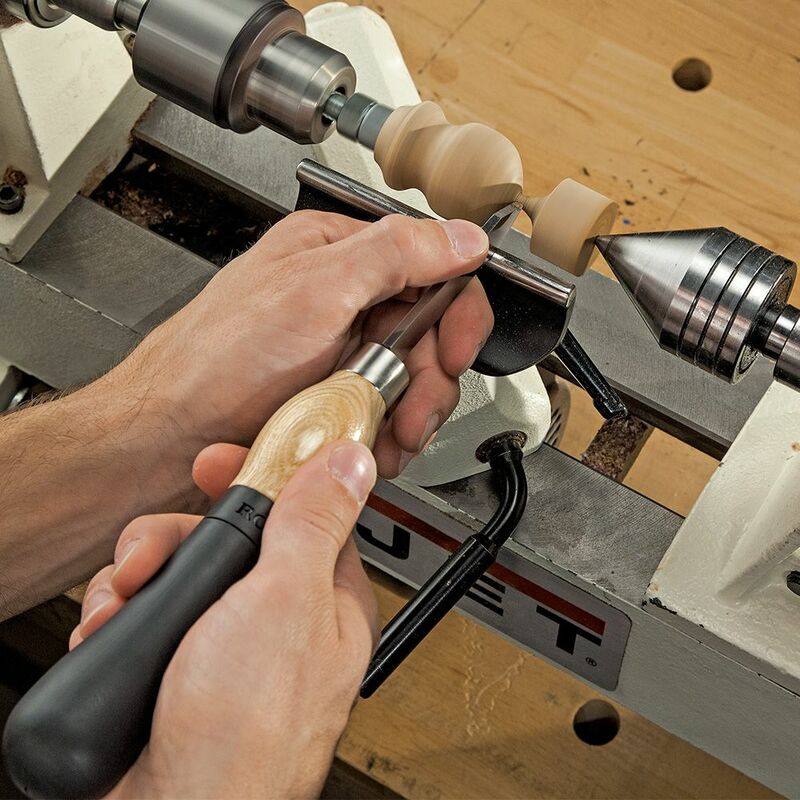 The angle of the tool and the position of the tool rest can aggravate turning. 3. You might be expecting too much. Sanding the last bit may give you the finish you want. I would check the speed of your lathe but most important to me is the placement of the turning tool to the wood being turned. The carbide tools will provide a beautiful finish if you are not overly aggressive. 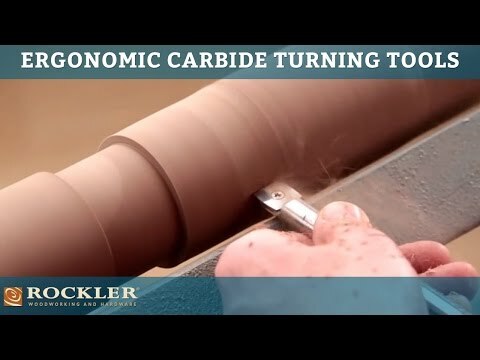 You Tube has a lot of short videos on turning with carbide tools and they are great instructional videos. 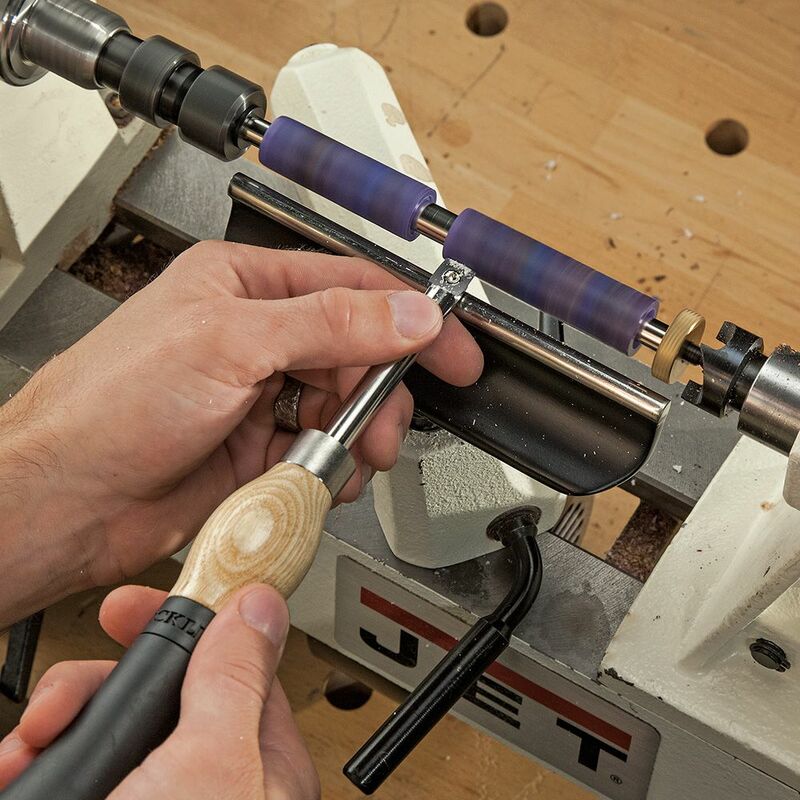 first start by increasing your lathe speed to the highest. Next take smaller cuts starting in the middle and working to one end and then back to the middle to the other end. Finally make sure you start with the round cutter first and do your finish cut with the square tool. Hope this helps. Try turning the tip up, at an angle away from the direction of travel. Also keep the handle down below the tool rest. 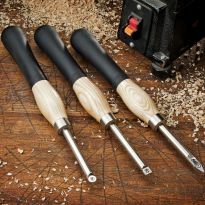 Will the micro easy wood tool cutters fit these? Has anyone used these for turning antler rings? 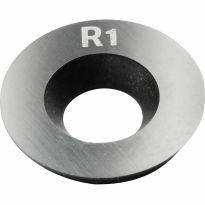 what is the replacement number for carbide tips (round and square) for the pen turning tools?